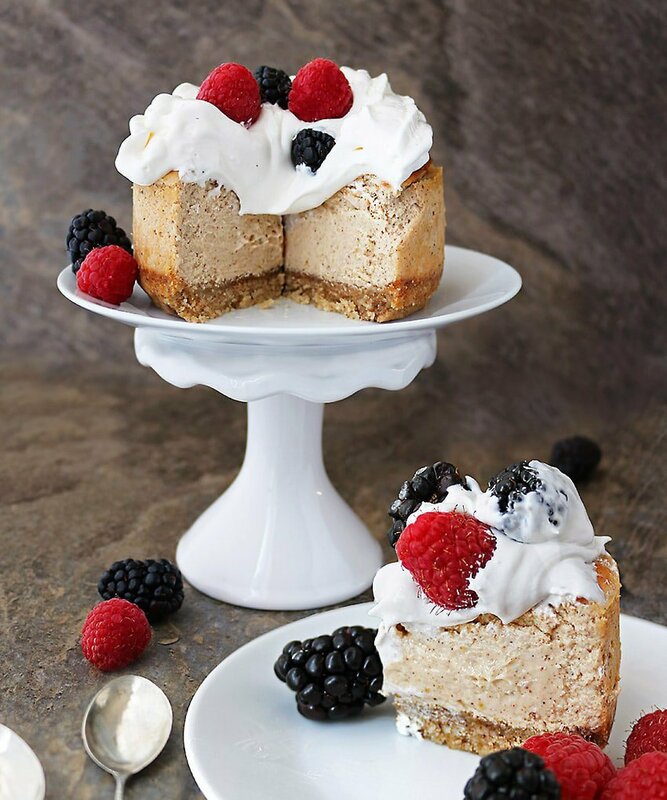 Sitting on a cinnamon and cardamom flavored almond base, this easy, gluten free, mini, Air Fryer Cinnamon Cardamom Cheesecake is deliciously creamy ~ serve it up with fresh berries and whip cream for a treat your family and friends will love. There have been many times in recent years when I have challenged the limits of my lactose intolerant insides by indulging in a slice of creamy and decadent cheesecake. Most times that slice of cheesecake has come from a store or a restaurant or has been one I tried at a friend’s home. Speaking of restaurant cheesecakes, have y’all seen, or tried, The Harvard by New York’s Spot Dessert Bar? The Harvard basically looks like a plant in a pot, and is described as a layered cake, cheesecake, cookie crumble built into a Terracotta pot and served with a sprig of parsley and “water” (tea) to pour over it. If you have tried it, I so want to know your opinion. As much as I love cheesecake, I’ve never made one of my own. I’ve made this strawberry/blueberry and this chocolate flavored no bake cheesecake-like cakes with cashews. I even tried making this cheesecake with beans. But, mental issues beyond my comprehension, held me back from trying an actual cheesecake made with cream cheese. At least, that was until I got my air fryer. I am still in the honeymoon stage of my love affair with my air fryer. It has me experimenting with whipping up cheesecakes and cakes of all sorts! Now, they haven’t all been a success. There was this one grain free chocolate orange cake I tried to make that was a total disaster. But, the beauty of the honeymoon stage of a love affair (at least for me) is that giving up isn’t really an option. After that chocolate orange cake failure, I decided to whip up an easy vanilla cheesecake. I went with a very basic recipe of cream cheese, sugar, egg, and vanilla on an almond crust. At first, I set the temperature of my air fryer way too high and the cheesecake was a tad bit burnt. Then, I didn’t set it high enough and the cheesecake turned out more like pudding. And then, I hit the sweet spot. I find plain cheesecakes a little too bland, so I decided to whip up a cinnamon and cardamom one to share on here. This cheesecake was so creamy on the inside – so flavor packed and so gone in 30 minutes after it was served. This is a mini cheesecake (and technically, it holds f.o.u.r. servings – all the same, my daughter and I annihilated it after these pictures were taken. Make sure to use a spring form pan – it makes taking the cheesecake out so much easier. 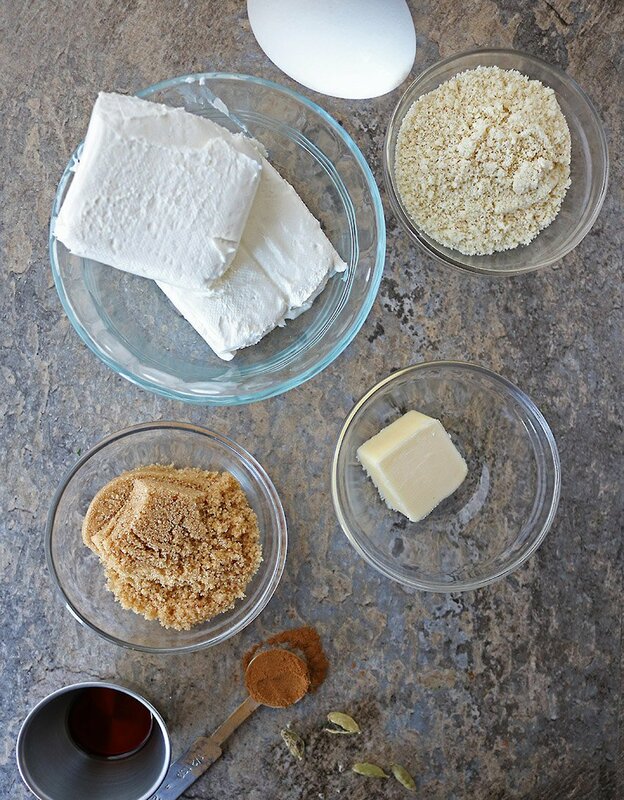 Line the bottom of your spring form pan with parchment paper – again, this helps dislodging the cheesecake from the pan and keeps the cheesecake from over baking on the bottom. Before placing your cheesecake in the air fryer, make sure that there’s room for it to expand – in other words, do not fill the spring form pan upto the top with the cheesecake filling. While I used cinnamon and cardamom to flavor my cheesecake, please feel free to experiment with your favorite spice-mix like pumpkin spice or nutmeg or anise. After you take your cheesecake out of the air fryer, cool it in the fridge for at least 3 hours before trying to remove it from the spring form pan. 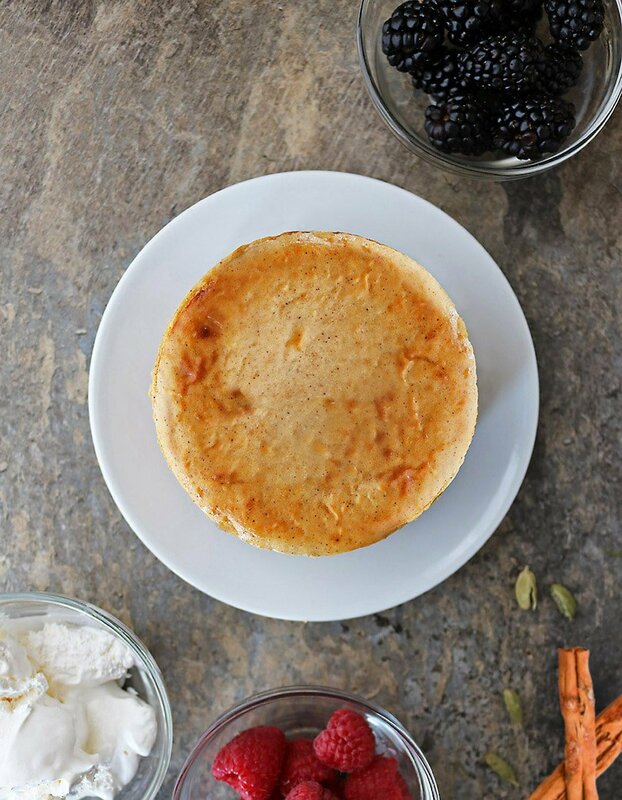 I so do hope you give this easy, flavor-packed, Air Fryer Cinnamon Cardamom Cheesecake a try soon and then please do let me know what you think of it. Place the butter in a microwave safe bowl and microwave on high for 30 seconds until butter is melted. Remove bowl from microwave. Add the almond meal/flour into the bowl with the butter along with the cinnamon, cardamom and brown sugar and stir well. Meanwhile, using the base of the mini spring form pan as a guide, cut a circle out of the parchment paper and place it inside the spring form pan. Spray the pan and parchment paper with cooking spray. 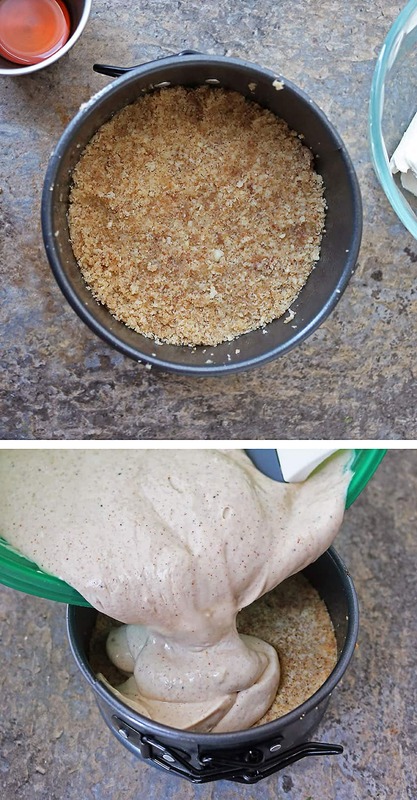 Then, spoon the almond crust into the spring form pan, and press into it. Set the air fyer to 350 degrees, place the spring form pan with the crust into the air fryer and air fry for 4 minutes at 350 degrees. Add the cream cheese, egg, vanilla, cinnamon, cardamom, and brown sugar into a bowl and mix well with a handheld electric mixer. Spoon mixture on top of base, making sure not to over fill spring form pan - leaving a bit of room on the top. Set air fryer to 300 degrees, place the cheesecake into air fryer and air fry for 12 minutes. Remove from sir fryer and place in fridge (while in spring form pan) for at least 3 hours. Then, remove from spring form pan and serve with fresh berries and whipped cream. 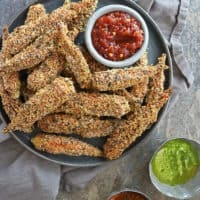 These chicken tenders are a favorite in our home. 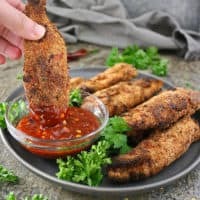 We are in the middle of unpacking and our air fryer is the first thing getting unpacked because these Spicy-Sweet Air Fryer Chicken Tenders are so darn quick and easy to whip up! would have never thought you can use an air fryer to make cheesecake! Now I need to go an buy me one as that gadget I haven’t added to my collection. Indeed that never giving up results in a positive outcome. Good job! This cheesecake looks beyond amazing! I can’t wait to give this a try and blow the entire family away! 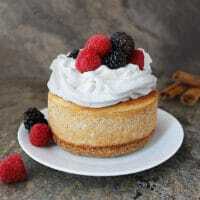 I’ve never thought of cheesecake in the air fryer! That’s genius!! And I’m completely on board with the addition of the cinnamon and cardamom! So yummy! Love that this is made in the air fryer! Looks so delicious! Can I just say this turned out wonderful! My entire family was astonished when I told them I made it in an airfryer! That’s a beautiful cheesecake! And I love the add of spices in it. I haven’t had one in ages. Cheesecake in an air fryer!? Now you’ve blown my mind, Shashi! Also, I’m more than a little shocked that you’ve never made a traditional cheesecake. I love cheesecake! And the best part is it freezes really well. I’ve almost always got some slices of cheesecake squirreled away in the freezer somewhere for a Friday night treat. Speaking of treats, though, the cardamom and cinnamon in this one sound delicious! I’m totally intrigued about using an air fryer to bake now. Well done, my friend! And it sounds like you and Lil S were rewarded for your efforts on this one! 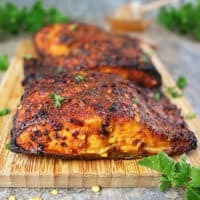 I just got an air fryer and can’t wait to try experimenting with recipes! 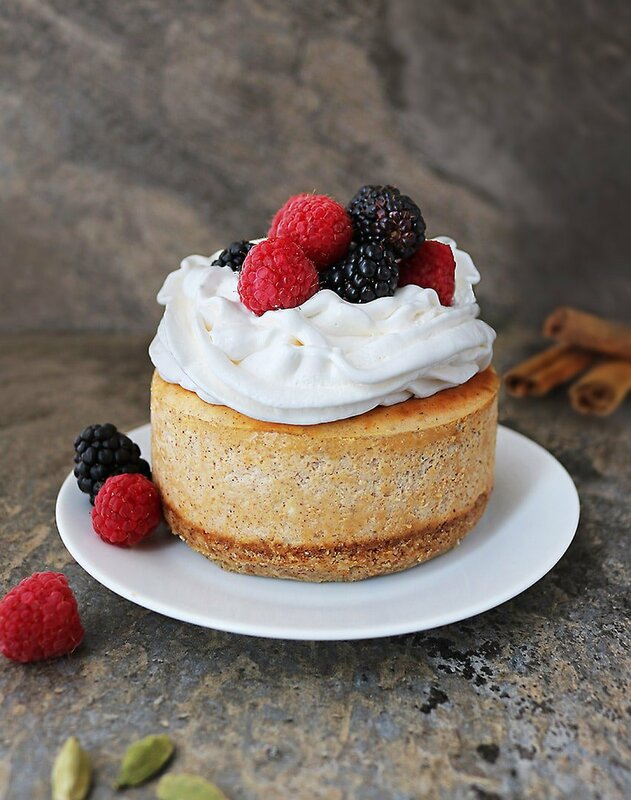 This cheesecake is gorgeous and hard to believe it was made in an air fryer!